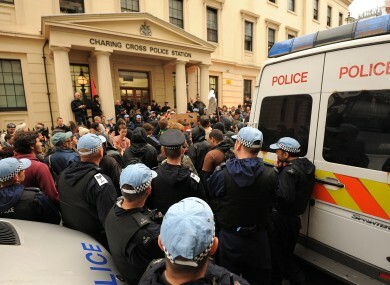 A large group of protesters occupied a former police station in Soho and had to be removed by police. Hundreds of riot police were deployed throughout central London today as protests took place against next week's G8 summit. POLICE IN LONDON have confirmed that 57 people have now been arrested in protests ahead of the G8 summit next week. Around 150 protesters paraded through central London yesterday, banging drums in a “Carniaval Against Capitalism” organised by the group Stop G8. There were several scuffles between demonstrators and dozens of riot police at the scene. Protesters hung a large banner reading “Make extreme wealth history” onto the famous statue of Eros at Piccadilly Circus. Another group of demonstrators, who had covered their faces with black scarves, marched with a sign saying: “No borders, no prisons, no capitalism”. There were just over 1,200 officers on duty as part of the Metropolitan Police’s operation around the G8 yesterday. Protesters were arrested for various offences including violent disorder, possession of pointed/bladed articles and a variety of public order offences. At one stage riot police forced their way into two buildings, one a former police station, in London occupied by anti-capitalist protesters to remove them. In a statement, Metropolitan Police said they had “a search warrant relating to intelligence that individuals at the address were in possession of weapons and were intent on causing criminal damage and engaging in violent disorder”. Today police said they expect further protests in London and officers will be deployed at key locations and “also act as a flexible reserve acrossLondon that can be quickly moved to respond to any incidents”. Police said that they sought to engage with protest groups “but at this stage no groups or individuals have engaged with us”. “We would continue to ask anyone who wants to protest in London around the G8 Summit to contact us so that we can work with them and facilitate peaceful protest,” they said. - Additional reporting from AFP. Email “57 people arrested in London as police clash with G8 protesters”. Feedback on “57 people arrested in London as police clash with G8 protesters”.